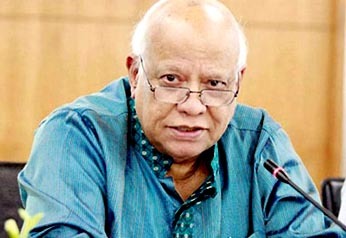 Finance Minister Abul Maal Abdul Muhith on Friday said if the present government continues in the office for the next five years, Bangladesh’s poverty rate would come down to 10 percent. “Bangladesh’s poverty rate was 58 percent in 1991, it came down to 24.3 percent now . . . and if the present government continues in the office for the next five years, poverty rate will come down to 10 percent,” he said. The finance minister was speaking at a gathering of the members of the One House, One Farm (Ekti Bari, Ekto Khamar) and Palli Sanchay Bank project at Sadar Upazila Parishad premies in Sylhet. He also inaugurated five development projects of the Upazila and laid foundation of seven other projects. About the 10 percent people living below the poverty line, the minister said only physically challenged people, widows and some other people will be included in this area under the project and they are getting all sorts of supports under the social safety net coverage like the developed countries.